How is it that American politicians are garnering so much wealth? During the 113th congressional session, 268 of the 534 members were millionaires. Richard Blumenthal of Connecticut, also classmates with Bill and Hilary Clinton, is worth $52.93 million dollars. Scott Peters of California is worth $112.5 million. Governor Rick Scott of Texas has a net worth $147 million. on homeland security is worth over $300 million. John Delaney of Maryland has founded numerous companies that are now listed on the New York stock exchange, and he is the only CEO of a publicly traded company to serve in the 113th congress. His net worth is $232 million. Jared Polis of Colorado, who is the first, openly sodomite parent to serve in Congress, who has a net worth of $72.09 million. John Kerry, former US senator and current Secretary of State which was earned primarily throughout his quarter-century-long service, and through his wife, Theresa Heinz Kerry, heiress to the Heinz ketchup fortune and also a beneficiary to a number of trusts from the Forbes family fortune. Kerry is worth $198.65 million. Mark Warner of Virginia holds a very large amount of wealth, estimated at $85.81 million. Warner made a lot of money during the telecom boom of the 1980s. Darrell Issa of California is worth $140.55 million. Issa was the richest official in the U.S., but has been recently been dethroned by a southern Governor, Tennessee's Bill Haslam, thanks to cheap gasoline. Bill's net worth is $2 billion dollars. Diane Feinstein, also from California, has a net worth $41.78 million. Are not these the politicians who, in many cases, are guilty of attacking, perverting, distorting, and violating constitutional law in an attempt to set a new course for the American people (Proverbs 24:21)? How it the president worth $7 Million dollars when his pay is $400,000 a year? He has only been in office for 7 years! Majority/Minority leaders make an average of $194,400 year. Not only was a ship owned by a member of Mitch McConnell's family busted transporting cocaine, but McConnell was also accused by Alison Lundergan of quadrupling his "net worth" on the backs of Kentuckians that can't afford it. McConnell is the 10th richest senator, with a net worth of between $9.2 million and $36.5 million. How is that? Harry Reid's net worth is between $3 and $10 million. How is that? Nancy Pelosi's net worth is $26.43 million. How is that? How is it that in many cases they enter service with little to nothing and before you know it, they are self-made millionaires? Is it inside trading? Selling out to special interest groups? Fraud? Embezzlement? In 2010, more than 150 lawmakers reported earning more from outside investments than from congressional salary. It is my understanding that they have been entrusted by the people and for the people (Matthew 24:12). It seems that many of these politicians fail to understand that government is not an auction as they sell their souls, the country along with the American people to the highest bidders (Mark 8:36). Compare all of the above information to the average yearly salary of an American soldier, which is between $23,424-$88,924 per year, or to the average social security recipient $1,335 per month. Yet, the American people have allowed these Judas' to dictate that which is right and that which is wrong when it comes to legislation in contrast to what has been established through common law (Deuteronomy 16:19). 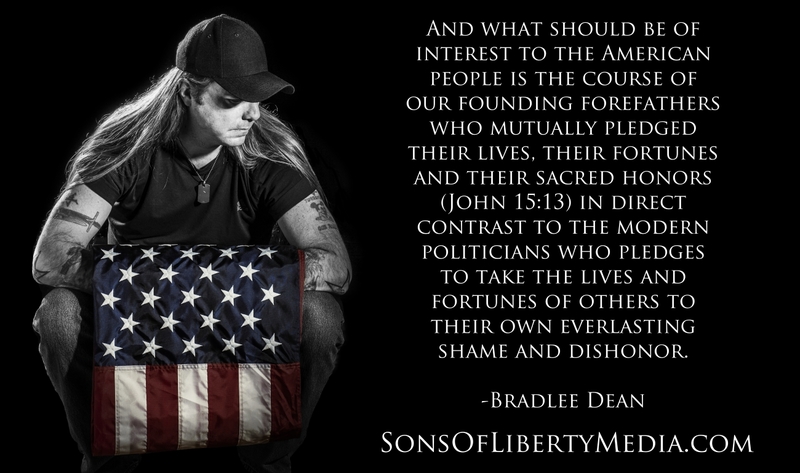 And what should be of interest to the American people is the course of our founding forefathers who mutually pledged their lives, their fortunes and their sacred honors (John 15:13) in direct contrast to the modern politicians who pledges to take the lives and fortunes of others to their own everlasting shame and dishonor. There are many cases where justice was not done concerning corrupt representatives. The list goes on from A to Z of those who were sent to serve the people, who were caught illegally serving themselves. I am sorry to say that the American people have failed in the area of justice (Amos 5:7). The lawless are winning only by default! Americans, for some reason or other, believe that ridiculing and mocking these criminals is enough. But the fact of the matter is that it is not! I simply answer, "That these corrupt politicians represent America's tolerance for criminals in their government. If it were not so, then why are they still there?